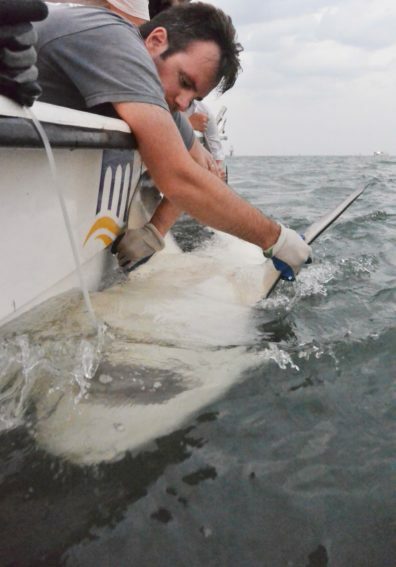 Dr. Charles Bangley is a postdoctoral fellow at the Smithsonian Environmental Research Center, where his research focuses on the movement ecology of coastal sharks and rays as part of the Smithsonian Movement of Life Initiative. He will discuss efforts to conserve and manage sharks and rays, a difficult task because of their wide-ranging habitats. Bangley is a specialist in identification of these essential habitats using high-tech tracking methods — such as telemetry and modeling in addition to environmental data — leading to better conservation and management efforts. His work is important for predicting the effects of human-caused impacts and environmental changes on essential echo habitats for migratory sharks and other elasmobranch species.